Home will go live on Wednesday April 24th thru Sunday April 28th. An extraordinary opportunity to acquire this traditional, with a modern beach feel home just steps from the ocean. This 1954 home was taken down to the concrete block and completely renovated in 2009. This spacious home is bathed in natural light with french doors that open up to pavered lanai, pool and fenced backyard. With this oversized lot, you will have room for all your beach gear, surfboards, kayaks and bikes so you can live the beach lifestyle! With views of the Atlantic Ocean from the master bedroom patio, mornings with your coffee will never be the same. 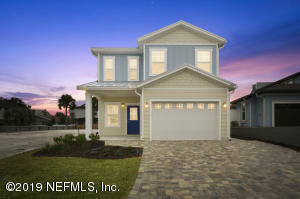 You only get a few chances to purchase a home east of third like this! Don't let this one get away. Experience the BEST is beach living in this quaint neighborhood at the end of the cul de sac, close to shopping, restaurants, schools. 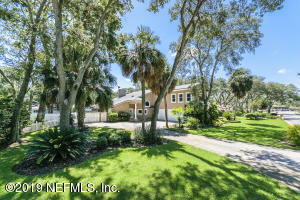 Amazing views of the marsh, on oversized lot. Premium finishings including gourmet kitchen, hardwood & high end bamboo (w/50 yr warranty) & ceramic tile. Soaring ceilings, oversized 2 car garage, large closets, user friendly laundry room with a chute from upstairs, AND a spa style sparkling pool! Kayak or stand-up paddle to the ICW with tidal access. 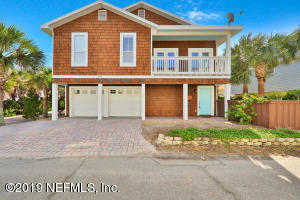 Call today to see this spectacular find in Neptune Beach! 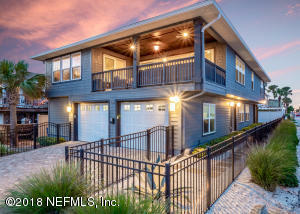 BRAND NEW CONSTRUCTION 1.5 BLOCKS FROM THE OCEAN! 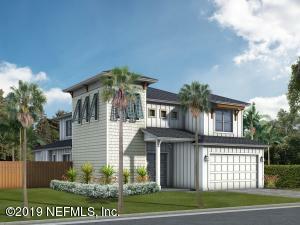 This custom, designer 2-story single family home features downstairs open concept kitchen/DR/Living combo with easy access through french doors to expansive covered back lanai perfect for entertaining. Gourmet chef's kitchen features statement, oversized food prep island, gas cooktop and combo wall oven/microwave, subway tile backsplash, ample, shaker style custom cabinetry with soft close drawers, white quartz counters and pantry. Owner suite with french doors open to spacious private balcony. Other features include paver driveway, outside shower, tankless gas water heater, 2nd laundry hook up, crown molding, polished chrome fixtures, irrigation system, full gutters, and so much more! DON'T MISS THIS RARE OPPORTUNITY! 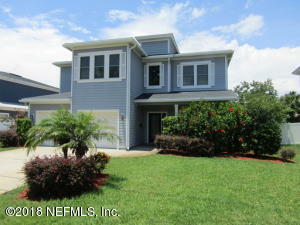 Hear the ocean calling you to this beautiful two-story beach home wonderfully located blocks away from the Beaches Town Center and only steps away from the beach! Feel the ocean breeze on the balcony and enjoy the captivating view of the ocean throughout. Feel at home in the open relaxed floor plan with granite countertops and stainless steel appliances in the kitchen. The first-floor guest suite offers an ensuite stand up tile bath with access to a fenced-in side yard. The upstairs master bedroom has its own private bath with custom paris gray limestone tile plus a huge walk-in closet with multiple shelving systems. 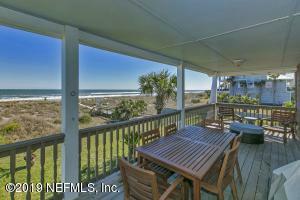 Make this beach home yours and enjoy it right in time for the summer season! PRICE REDUCED 30K!! 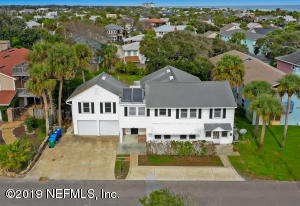 Lovely 4 bedroom, 2 1/2 bath home only a couple of blocks from the Atlantic ocean and Neptune's fantastic beach. Open floor plan with kitchen overlooking dining area and second living area. 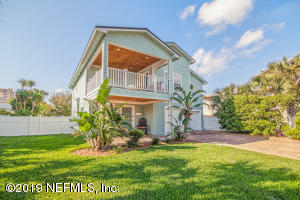 Double sets of french doors open into ground floor screened lanai overlooking backyard. Plenty of room to expand or put in a pool! Separate office on first floor with french doors for extra privacy. Wood floors throughout first floor, up the stairs, and across loft area of 2nd floor. All bedrooms upstairs, split bedroom plan. Master has huge walk in closet with built ins, large private master bath, and covered 2nd floor patio off master through french doors. Great place to watch the sunrise with your morning coffee. Lots of windows and natural light make this home a can't miss!